Red leather, ankle strap, platform sole. 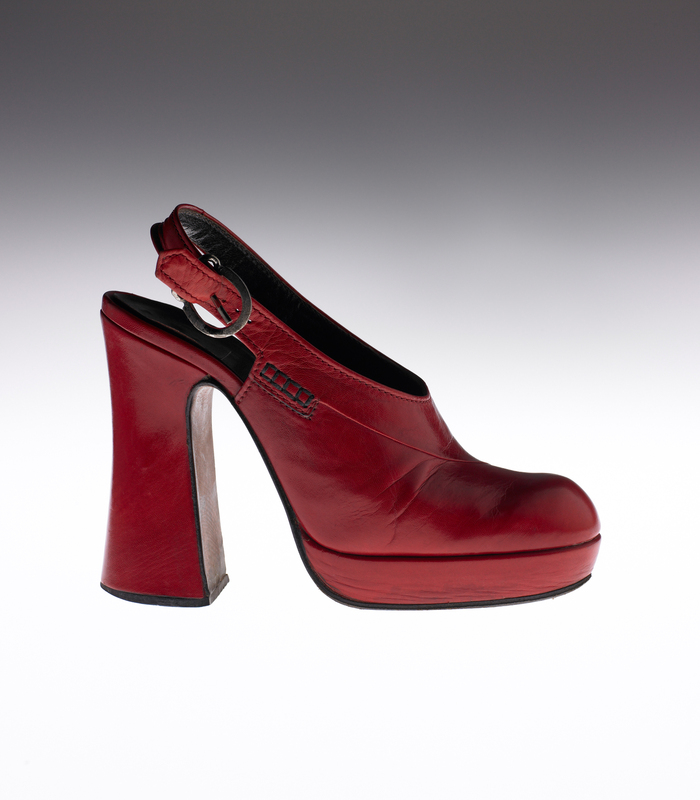 Shoes with a bump toe, 2 centimeter platform sole, and a chunky heel exceeding 11 centimeters, clearly demonstrating the characteristics of the plaform shoes that were in fashion in the early 1970s. Platform shoes were also popular in the 1940s, but in the 1970s they were worn with retro dresses or bell-bottoms. In the second half of the 1960s, “counter-culture” young people led protest and criticism of the established system, and the fashion was for folklore styles and jeans, which originated in laborers’ workwear. As part of advocating a move away from the establishment to the periphery, London boutique BIBA and others brought in nostalgic trends. Yves Saint Laurent contributed to this trend by presenting 1940s looks in his Spring-Summer 1971 collection dubbed “retro”, bringing back square-shouldered jackets, turbans, and platform shoes, and promoting the idea that images from the recent past could be enjoyed.